Learning how to edge progressively is one of the most important skills in wakeboarding. Virtually every trick uses a progressive edge, as it's the key to getting the most height possible while staying under control. 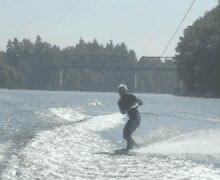 Every wakeboarder should take the time to learn how to edge progressively, it'll help out in the long run. Here we explain the keys to Toeside progressive edging. First, let's define what we mean by a progressive edge. A progressive edge is when you edge on your wakeboard and build up the amount of edge slowly, so that your maximum edge is when you reack the top of the wake. By "maximum edge" we mean that your speed and line tension are at their hardest when you reach the wake. Think of how a pendulum swings. As it goes out to it's highest point, the ball on the pendulum is moving at it's slowest. When it swings back towards the bottom, it starts slowly, and builds up speed "progressively" until it's at it's fastest point at the bottom. In wakeboarding terms, the wakeboarder is the ball cutting out wide, and you want to wait for the boat to begin pulling you back towards the wake, as it starts to pull you, you begin edging in with the proper body position, and build your edge so it's at it's hardest as you reach the wake, which is the bottom in our pendulum example. 1. Ride and be able to edge and carve well. 2. Be comfortable crossing the wakes toeside at high speed. 3. Be able to ollie. 4. Learn your Heelside Progressive Edge. Watch this trick as a AVI movie (1.5MB), or as a Quicktime movie (1.1MB). The setup for a toeside progressive edge is to casually cut out about 10-15 feet outside the wake on your toeside. You want to stand extremely tall and just ride straight while waiting for the boat to begin to naturally pull you back towards the wake. Resist the urge to begin your edge earlier then that. Stand tall, and keep the handle in tight on your front hip as the boat begins to drift you back in. As the boat starts pulling you in, resist the urge to bend over at the waist. You want an even amount of weight on both feet, and slowly start applying more pressure on your toes to increase your edge. 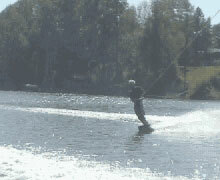 Continue to build a harder edge as you get closer to the wake by staying tall and applying more pressure on your toes. You should feel the tension on the handle increase, and keep it tight against your front hip. As you ride up the wake, make sure you aren't bending over at the waist, and that you have your legs mostly straight so you don't absorb the pop from the wake. Notice how the rider keeps his line tension by keeping the handle in tight to his hips. Standing tall and keeping the line tight is what generates your pop (air). You don't want to ollie, or jump. Just stand tall and keep your weight even over both feet. 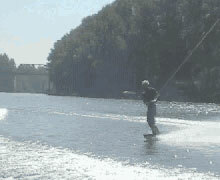 If you stand tall and keep the rope in tight after eding progressively into the wake, you should get good pop. To help control it, continue to keep the rope in tight by giving the handle an extra pull with your back and get your eyes on the horizon or shore you're travelling towards. Now you're ready for a whole new world of toeside tricks. The Toeside Progressive Edge helps you learn just about every toeside trick. See our Trick Tips section for tricks that utilize the Toeside Progressive Edge.